My first exposure to David Lynch came from Twin Peaks during its original airing back in 1990. I was only 14 and knew nothing about his work, but I was immediately drawn to the mix of terror and quirkiness that he brought to the show. It was clear without seeing his earlier films that an original artist had created it. Over the years, I’ve caught up with most of his movies but only saw his debut Eraserhead in 2011 for this blog. That black-and-white film included themes that have carried through Lynch’s entire career, but the story felt more distant. Two years later, I’ve finally gotten the chance to see his critically acclaimed follow-up The Elephant Man. It has a similar black-and-white style yet finds a way to bridge the gap. It was a commercial hit and received eight Oscar nominations, which are a surprise given Lynch’s outsider status. Does his second film retain the elements that make him unique? That question was fresh in my mind when I sat down to watch this film. John Merrick (John Hurt) is born deformed after his mother is attacked by a wild elephant. 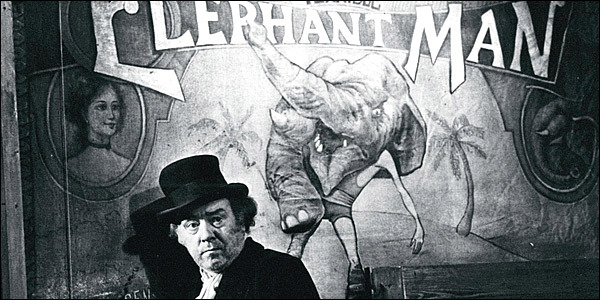 Known as the “Elephant Man”, he's presented as a freak by his manager Bytes (Freddie Jones). 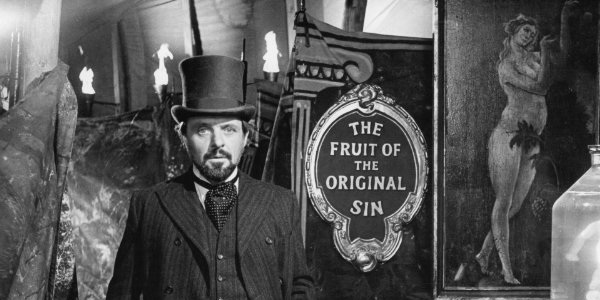 When he’s discovered by Frederick Treves (Anthony Hopkins), his fate changes dramatically. 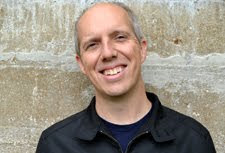 Merrick is an intelligent man who's faced terrible cruelty. Treves develops a friendship with this misunderstood guy and fights to pull him out of his former life. How does this film connect with the themes of Eraserhead? 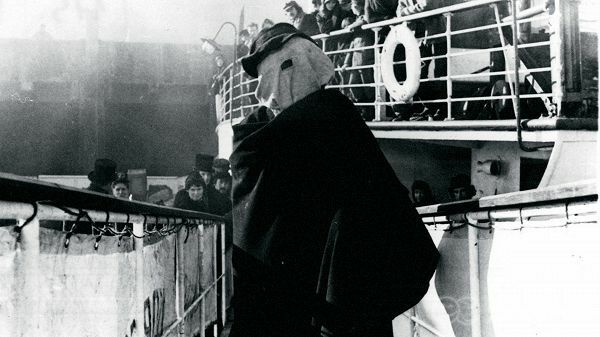 While it lacks the haunting imagery that dominates Lynch’s first film, The Elephant Man retains his interest in society's fringes. The opening shots of Merrick’s mother screaming are extremely chilling and set the mood for the entire story. He’s misunderstood as a monster, and the terror of facing the public remains with Merrick. The overall message is upbeat, but Lynch creates a tone of dread that matches Eraserhead. When life is going well, it feels like it’s only a matter of time before this hope crashes back to reality. Where is Lynch venturing in a new direction with this film? The larger budget and positive story are a big change from his challenging debut. We spend a significant time at the freak show, yet the heart is the relationship between Merrick and Treves. This is the type of film that wins Oscars, though it’s presented in a much different way. Lynch pulls back and lets the actors create full-fledged characters. This approach slows down the story and risks losing our attention, however. It never goes too far down that road, but my interest wasn’t as intense as Lynch’s best work. Even though he’s hidden behind lots of make-up, John Hurt brings great emotion to the title character. When the night porter (Michael Elphick) shows him off like a monster for the crowds, it’s heart-wrenching to watch their behavior. It’s a scene right out of Frankenstein, though Merrick is hardly an artificial creation. When he finally shouts “I am a human being!” to a train station crowd, it’s a rare moment of defiance from a guy who’s faced this type of scrutiny for his entire life. Anthony Hopkins does his normal stellar work as Treves, and Freddie Jones brings plenty of nastiness to Merrick’s brutal handler. Does Lynch avoid the "sophomore slump"? If so, how does that happen? Lynch saved his disaster for his next project with Dune in 1984. The Elephant Man brought his voice to the commercial arena and delivered both creative and financial success. I’m glad to have finally caught this film, and there’s plenty to like. That said, it doesn’t rank among my favorite Lynch movies. It’s mainly due to personal preference and limited interest in this story. It’s an impressive achievement, particularly with John Hurt’s performance. There’s also quite a change from Eraserhead and shows that Lynch can deliver a more traditional project. Next week, I’ll venture into the world of Godard for A Woman is a Woman. I like this one, mostly based on the strength of Hurt's performance, which is one of the best of a pretty storied career. If memory serves, a lot of people were very upset that the Academy didn't give a special award for the make-up/costuming, resulting in a new award category being created. I like Dune, but I admit it's a guilty pleasure. Steve, I also read about the creation of the make-up and how this film inspired the award. I'm not sure every winner since has been so revolutionary, but it's definitely worth it here. It's easy to forget that John Hurt is under all that make-up. The fact that we see the person who Merrick is behind his look is remarkable. Great write up Dan. Been meaning to check this out for a while. Looks a fascinating watch. Thanks Chris! It's pretty slow going, but I think it's worth checking out. I wasn't blown away but think there's a lot to like. This is one of my favorite films from Lynch as it was accessible and moving while also having a bit of weirdness into it. I should also note that Mel Brooks was the producer behind this film which explains Anne Bancroft's appearance and why John Hurt does those cameos in other Mel Brooks films. I did hear that Brooks was the producer, though I didn't connect the Anne Bancroft appearance. That totally makes sense. I agree that it's one of Lynch's more accessible films while still having some craziness. This was an astonishing film. I loved this movie, and Hopkins and Hurt give wonderful performances. Great write up here. Can't wait till the next one. Godard is my FAVORITE filmmaker ever, and his run in the 60's is inmatched, in my eyes. Great idea for a series too. Glad to hear that you're enjoying the series. My Godard experience is pretty limited (only three so far), so it will be cool to check out another one of his early films. Excellent review. You touched on one of the things I like most about this movie, which is that it is so wildly different from Eraserhead. I really respect The Elephant Man for that. And yes, sadly, Lynch saved his slump for Dune. Yikes, that's a rough one. Alex, it's interesting that certain scenes have a similar look to Eraserhead, yet the tone is so different. It's a step forward in a lot of ways, though not as crazy as Lynch's most distinctive work. It's interesting that Lynch's film about the tragic life of a deformed man - with its black and white photography, unsettling depictions of 19th century medicine and approach to mental health, and downbeat ending - is his most accessible movie. Perhaps that says more about Lynch than The Elephant Man but this is a terrific film. That does say a lot about Lynch, particularly since I don't think a lot of movie watchers (besides film fanatics) are going back to watch this movie. I'm guessing The Straight Story may be a better choice, but I haven't seen it yet. Regardless, there's a lot to enjoy in his second movie. Thanks for the comment! I agree with you about not being too interested in the story. This is why I've been avoiding this movie for so long despite it being Lynch. Great review. It's the perfect kick in the arse to go and finally see this. It's worth seeing for sure, especially if you're interested in Lynch. Judging by the comments from others, I think my reaction was even a little more lukewarm than most. I'd say go for it. Like you I first head of David Lynch via Twin Peaks. I liked this film quite a bit and I would place it among the best that Lynch did. Later in his career he got lazy and just threw a bunch of stuff on screen and let his fans make up the plot for him. He'd encourage them from time to time by offering "hints" just to start a second round of frenzied speculation on the "real meaning" in his films. The Straight Story is a notable exception to this. I don't totally agree with you on Lynch's later career, but it varies from film to film. I agree that The Elephant Man is a more straightforward story, though it still has some crazy imagery. I can't argue with anyone who prefers it to Lynch's more recent movies. There is an element of what you describe in them, especially Inland Empire. Chip, thanks for stopping by!